Do you get it? Chicka-dudes. Sometimes, I don't think Jarrod fully appreciates my humor. I say hilarious stuff like that all the time and he just shakes his head. Sorry I've been MIA this week; I don't even have a good reason. I just kind of went on... blogging strike. Well, that and I was a little overwhelmed by the 600+ photos I took over the last couple weeks and just didn't know where to start on the editing. I've been folding the same three loads of laundry all week. I keep folding them and sorting them on my bed and then leaving them there. Then when we go to bed, Jarrod plops them on the floor and messes the piles all up. So the next day I do it again. Does anybody else have this problem, or is it just me? I'm pretty sure tomorrow is going to be the last day I do this. Yep, definitely going to put them away tomorrow. Yes, we rented a little cabin on a lake not too far from our house, and we borrowed a little fishing boat from some friends. "Well, the good news is, we caught a fish..... the bad news is the motor fell off the boat in the middle of the lake." And that is why I do not like borrowing other people's stuff. Sometimes I take pictures of my kids at their best. Tonight my household was in complete chaos while I was trying to make dinner and I slammed a spice jar down on the counter in my frustration. I slammed it so hard, I popped a blood vessel in my finger and made it turn purple. "Well, self, did you learn anything?" I've decided to give yoga a fair shot at making me skinny. The last time I went to the gym I mixed it all up with a zillion different classes and didn't see a lot of results, so this time I'm going to just do yoga four times a week and see what happens. After all, Jennifer Aniston looks awesome and I heard she does a lot of yoga. I don't want scary-Madonna arms, though. Somebody tell me if I approach this point, m'kay? Thanks for tuning in for yet another episode of 'Fess Up Friday! I don't have a whole lot this week, so I'm hoping that you do. Can't wait to see what you link up. So. What should one ask before renting a cabin off of Craigslist? What do I do if someone is parked in the driveway, sleeping it off in his truck? Is there anything, anything at all, that we can do in the house if it rains for three days? Those kinds of things are all good questions to ask before renting a house off of Craigslist. ah haaaaa - you make me laugh....and smile. 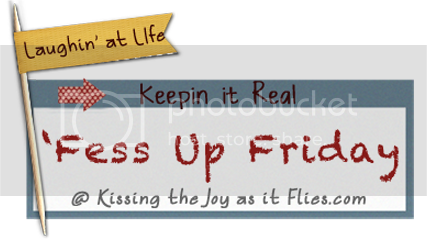 I LOVE your fess up friday - it totally rocks. I love that you are so REAL. I want to play along but I'm not sure how to link - LOL. I'm going to give it a try. Have an awesome weekend! i took a pic of my son picking his nose this week as well. madonna arms are super scary! how in the world did you ever find that super scary picture of madonna's arms? I would have nightmares! Serious nightmares! Does she do yoga because if she does, don't even think about it. I know Jennifer Aniston is beautiful, BUT there is a better chance that you would end up with Madonna arms and not Jennifer Aniston arms. I say this because I know the ways of Isaac Newton or Mr. Murphy or whoever it is. If Madonna does yoga, do not do yoga. I repeat--DO NOT DO YOGA! the slamming of the spice jar makes me smile..only because i threw my coffee cup into the sink when i was mad and broke it...one of my favorite mugs. not my shining moment. have a good weekend...hope you get some warm weather soon! True story, Gianna, I googled 'Madonna's scary arms' and that picture came up. Apparently I'm not the only one who calls them that. I think I'm safe doing yoga because I'm fairly positive it is physically impossible for me to ever lose enough fat for you to see my muscle fibers. I think you would have to work out every day for.... ever. And there's no chances of that. We went raspberry picking last week and as we were leaving I looked down at Ethan's feet and realized he was wearing two different shoes. A red shoe and navy shoe. At least they were both crocs? Good luck with yoga! I need to get doing something because I have gained at least 5 pounds on vacation this week! As a Christian you need to do some research into yoga, since it's a hindu practice and every single pose is a hindu pose, so there for intentionally or not...you're worshipping hidu gods. People will try to justify it by saying I am not doing it, but all I can say is Moses, Isrealites, and the Golden cow. We can no better, but when we do it anyways, we're disobeying God and not honoring him. I understand your position, but I use the term 'yoga' loosely. I take the class at a Christian Community Center and they play Christian worship music during it and it's taught by a Christian woman and the class is technically called 'stretch and tone' I don't believe that you worship without intention, and the Israelites were very intentionally worshipping that golden cow with the express intent to find themselves a new god. I do not consider that the same thing as me strengthening my body by doing planks for an hour and stretching. He told me to be a good steward of my body and I really believe these exercises are good for you. I understand that there are some yoga classes that are very spiritually focused, so I understand your concern, but I'm not taking one of those. Honestly, it actually is the only quiet hour of my day and I spend most of it praying. Thanks for the input, though!